The reason for all this preliminary work is to be sure that your idea is developed as you see it in your mind's eye. If the drawing is not as you want it to be, if you don't like the way it looks, if it does not portray the picture you have in mind, by all means throw it away and start anew. I have often made half a dozen drawings of a new pose or new form of eagle before I was satisfied with the over-all picture. It is always easier to correct your mistakes with a pencil on paper than with a carving tool on the carving block. The care and patience with which you make your layout sketches are reflected in the finally executed carving. When I make my drawings I try to keep a picture of how I am going to make out of wood the parts I have drawn. It is quite essential that this be kept in mind. There are certain limitations to what can be done with wood. I cannot, within the compass of this work, begin to enumerate them. They have to be found out through experience. Before you commit your drawing to the carving block, or to limbo as the case may be, walk off and take a long look at it. Then walk out the door. Forget it. Go about some other business for half a day. Take up your mind with other things. This is quite important. After you come back and review the drawing, you will, in all probability, see where it can be improved. Make the evident or obvious changes then and there. Oftentimes a coffee break at this juncture is a lot of help. A few minutes spent in studying your design will show you the difficulties you may have to overcome in the actual carving. Never let these difficulties deter you from proceeding with the work. Go ahead. If you make mistakes, keep this in mind: you can always start over again. "The man who never does anything always has the eraser on his pencil unused." All my pencils are well worn down at the eraser end. 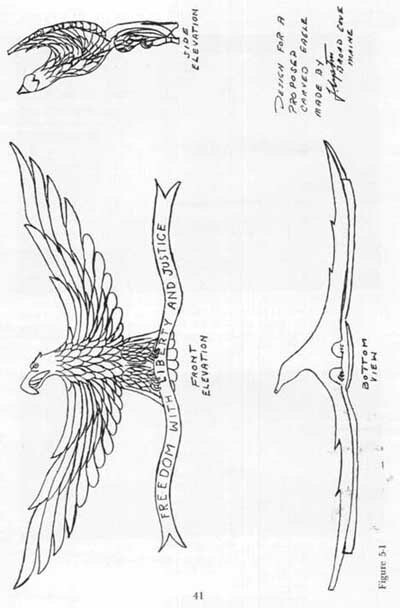 The body and wings. 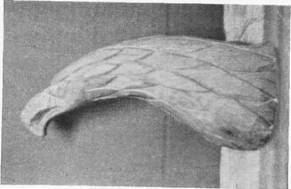 The legs and claws are detail-carved; the wings lined out with the pencil. The body is jointed for reception of head. The head and body pad detail-carved. The elements are assembled. All detail carving is done. The final step will be to polychrome the carving. The completed carving. 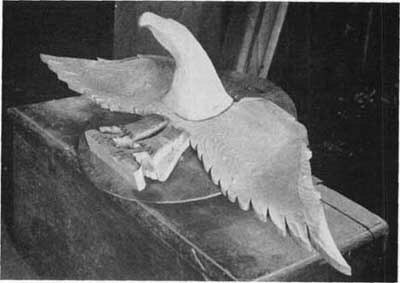 This eagle measures 48 inches wing tip to wing tip, 17 inches high, with the head projecting 9½, inches. Keep in mind the fact that, as you work with wood, as your carving grows from a piece of plank to the final piece, you will see places where you think it would be improved by departing from your design. If that is so, make the changes forthwith. After all, it is your design, your carving, your idea-and if you can't change your mind, well, why say more? Once you are completely satisfied with your original layout in all respects, it may be of some help to make a projection of the drawing so that you can see all the varying planes you want to develop on paper. These can be done by shading in or by making a series of isometric drawings, as the case may be. These are only aids and should not be followed in the final work. If you have progressed from a bas-relief to an alto-relievo you may well want to undertake a more difficult piece of work. An illustration of this project is shown in Images above. This Bremen Eagle has a projecting head, a body pad, and the base plane of the wings. It is built up by joining the various pieces with glue and wood screws and plugs.